MANILA, Philippines – Remember when your teacher asked the class to prepare a piece of paper for a quiz and everyone would look at you and say, “pahingi”? This student shared a genius idea on how to lessen giveaways to his classmates and even save up on some cash. The creative student said that at first he was planning to write his name on all pages by hand but realized that printing them would be so much better. Ambrocio said, “At first, isusulat ko lang dapat yung pangalan ko sa lahat ng page kaso tinamad ako. Naisip ko na may printer nga pala, kaya ayun. 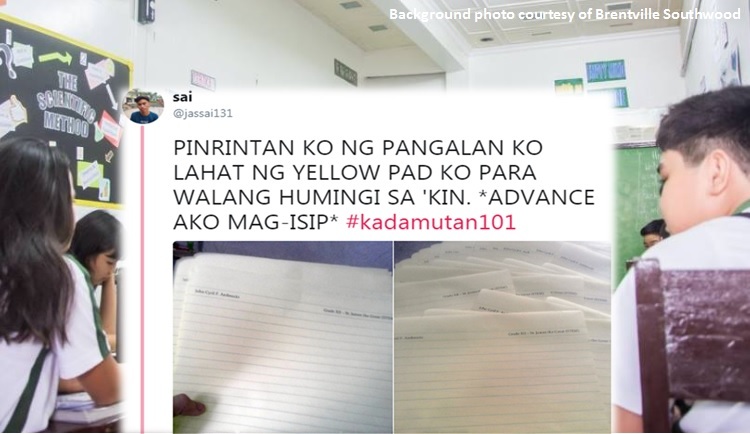 I tried kung gagana ba sya if magprint ako sa yellow pad. Then ayun nga, it worked, HAHA!" His idea seemed to work as Ambrocio noticed that his yellow pad supply no longer ran out fast than before. Ambrocio explained, “Kakatuwa ba na gumana kase kahit papaano, hindi na agad ako mauubusan. Ohaaa!!" The tweet has gone viral with over 43,000 likes and more than 9,000 retweets to date.